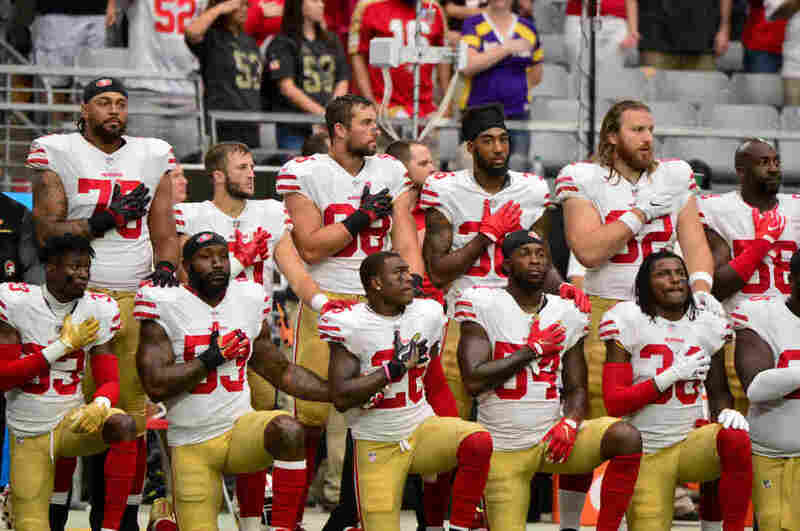 Your Questions About Activism In Sports, Answered Why is the anthem played at sporting events? Do athletes have a positive impact on political or social change in the U.S.? Here are some answers to questions from our call-out on sports and activism. Members of the San Francisco 49ers kneel during the national anthem prior to a game against the Arizona Cardinals at University of Phoenix Stadium on Oct. 1. This week, President Trump refused to let up on his rebuke of the NFL for allowing players to kneel during the national anthem. His response to these on-the-field demonstrations, along with the growing number of athletes who took part in them, prompted Morning Edition to seek questions from you — our listeners — earlier this month asking what you would like to know about the intersection of sports and activism. Why do we have the national anthem at sporting events at all? What is the connection? Do other nations do this? — Neal J. Ney, Evanston, Ill.
Marc Ferris, author of Star-Spangled Banner: The Unlikely Story of America's National Anthem, says the tradition of playing the anthem is largely tied to the growth of the United States in the 19th century and morale during wartime. The first documented instance of the song being played during a sporting event is in 1862 during the Civil War, in Brooklyn, N.Y.
Ferris says the 1918 World Series — during World War I — is sometimes incorrectly credited as the first time and also as the one that set the game-opening precedent, though in those early days, it wasn't all that common. "It was during World War II that it became an every-game phenomenon, in large measure due to the gravity of the situation, but also due to the fact that they now had sound systems and they could amplify a singer, play a recording or have an organist play," he says. "And so, when we declared World War II in December 1941, then the season started in 1942, and that really is when all the teams adopted it." Ferris also says the U.S. is unique in how ubiquitous the anthem is at many sporting events, compared with other countries. "Other nations do not do this to the extent that we do," he says, "playing it before every single contest — a high school volleyball game, a college basketball game, and professional sports." In most other parts of the world, Ferris says, "anthems are only heard during international competition." Do players have any legal power in court over coaches and owners if they are benched or fired for protesting? – Andrew Gomez, Washington, Pa. I have heard people say there is no right to political protest or expression on the job, hence players can be compelled to stand for the anthem. Is that really true? Do we cede rights when at work? – Chaz Hinkle, Charlotte, N.C.
Kim Wehle, a constitutional law professor at the University of Baltimore School of Law and former federal prosecutor, says the NFL and other private employers can legally ban employees from exercising free speech rights while on the clock, as long as a government entity isn't directly involved in that ban. "When it comes to the First Amendment, which is the part of the Constitution that I think most people think about when you're talking about free speech, we do cede rights when it comes to employment," says Wehle. "So the First Amendment actually only binds government behavior," she adds, meaning the behavior of government officials. So, she says, it would violate the Constitution if, let's say, any federal employee tried to remove a player from an arena for taking a knee during the anthem. But that is not necessarily the case for private employers, including NFL team owners, according to Wehle. "There are federal laws that protect speech in the private context if it's related to your employment. But you can make an agreement — sign a contract — that essentially waives those rights. So the first question would be, in the collective bargaining agreement that binds these players' terms of employment with these football teams, does it essentially waive the other federal labor law protections? But my understanding is that it's pretty vague and that it's not clear one way or the other." Is there an example of athletes actually having a positive impact on a social or political change in America? — Russ Olson, Spokane, Wash.
Louis Moore, history professor at Grand Valley State University in Allendale, Mich., and author of We Will Win the Day: The Civil Rights Movement, the Black Athlete, and the Quest for Equality, notes several examples of athletes who prompted the integration of their sports and their communities. "Athletes were a major part of the civil rights movement. Jackie Robinson, for example, he was part of a movement to get rid of police brutality. [Former NBA player and Boston Celtics center] Bill Russell, for example, marched in 1963 in Roxbury in solidarity with those marchers in Birmingham. He and his wife also worked to integrate the school system in Boston." "The New Orleans Saints tried to get a professional football franchise in that city, and the NFL made them integrate that city before they got a franchise. So the mayor of New Orleans and the governor of Louisiana had to promise the NFL that they would get rid of racism. "The reason I bring that up is to suggest that NFL organizations and teams, if they wanted to, could do something about racism in their cities." Ashley Brown is an editor at Morning Edition and Jacob Pinter is a producer at Morning Edition.